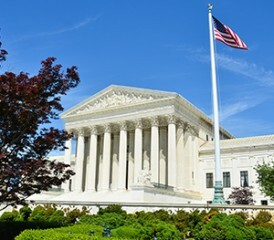 The United States Supreme Court has a case on its hands that may set a very serious precedent for some businesses, consumers and mesothelioma patients alike. In the case of Kurns v. Railroad Friction Products Corp., the highest court in the country will be deciding whether or not state regulations will supersede federal regulations for locomotive safety. Gloria Kurns, daughter of a long-time railroad worker who died of mesothelioma that traced to asbestos exposure from railroad parts, is suing Railroad Friction Products Corp., the company that manufactured the asbestos-containing product that caused her father’s death. Lower courts decided that manufacturer’s claims are correct in that railroad companies should not be responsible if federal regulations don’t provide guidance on locomotive safety. Now the Supreme Court will decide whether or not to hold up this decision. The issue stems from the fact that federal laws involving locomotive safety don’t mention asbestos, so Railroad Friction Products believes that they should not be responsible. State laws, on the other hand, indicate that the company holds some of the blame. The initial decision from the lower courts was made on September 9, 2010 by the United States Court of Appeals for the Third Circuit. In 2011, as Kurns held firm in her stance to continue fighting, she moved her case to the docket of the Supreme Court. Because railroad safety has been shared among the federal government and the state, lines of how regulation requirements should be split come to a junction with this case. According to the advocacy group Alliance for Justice, the Federal Railway Safety Act allows states to enforce their regulations on railroad safety until federal law is passed that concerns the same issue. This argument pushes for the states’ ability to enforce regulations until federal rules are enacted, while the contrary argument says that the lack of federal regulation should hold firm over state regulations. As the case is still being decided, many businesses, employees and consumers in the asbestos industry may be paying close attention. If Kurns wins the claim, a precedent may be set that requires businesses to be subjected to more stringent safety regulations at the state and federal level. This may mean that companies like Railroad Friction Products Corp. will not be able to deny accountability to future employees who may develop mesothelioma as a result of working with asbestos-laced products. On the other hand, if the Supreme Court holds up the lower court’s decision, critics and labor advocates believe that employees may suffer by losing out on holding employers accountable for safety standards. Alliance for Justice holds a strong position on what will occur if the high court upholds the decision. “It will prevent injured citizens from holding railroad manufacturers responsible for violating state safety regulations, many of which speak to local safety hazards and provide more stringent protections which are not afforded by federal laws,” noted the organization. Beyond the details of the case, it is important not to get lost from the fact that a man died from mesothelioma, a rare and terminal cancer that is caused by asbestos exposure. Kurns’ father is one of the 2,000 to 3,000 Americans who die each year from this disease. As his life cannot be brought back, accountability, responsibility and compensation can be provided to the appropriate parties. Railroad Friction Products Corp. may eventually hold liability in this case and may be prevented from denying compensation to more employees in the future.